Although our recent (1800 – present) Van Rooijen history is based on documents available from the various Dutch and European archives and on family papers, the early history relies at present on secondary sources such as the 1993 book by Frank Pouw titled “Familie van Rooijen te Jutphas (een oud geslacht)”, for which our family was also interviewed. He in turn relied upon work of E. Rosenbaum (genealogist from the early 1900’s), Booth (Genealogist from Utrecht) and A. van Eck (Utrecht) for some of his early information, in addition to his own research in various archives and documents. We hope at some point to independently confirm this information, but for now, present this information as “most likely”. We are also waiting for results from Y-DNA tests on this line which should provide some additional support for documentary evidence. If you know of anyone of this line who has either taken autosomal or Y-DNA tests, please contact us. It is likely that the origin of the name came from the practice of “rodung” or making new ground suitable for farming, either by slash-and-burn techniques or by improving drainage of the land. 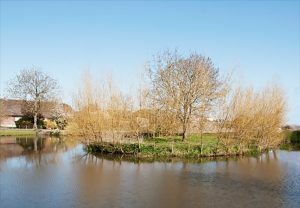 In our case, this last seems likely due to the low-lying land and the proximity of various bodies of water such as the Lek and what is now known as the Koninginnensluis and the Vaartse Rijn (“de Vaart” on the map) as well as various small creeks. The name has been spelled Roeden, Roden, Rooden, Royen, Roijen and Rooijen. 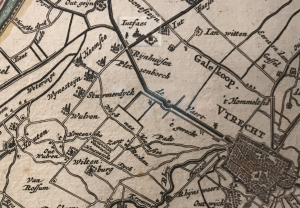 The center of the early Van Rooijens seems to have been in the area of Jutphaas, now a neighborhood of Nieuwegein, and in the early days, spelled Jutfaes (see highlighted portion of an old Nicholas Visscher map from the late 1600’s in our possession). Note that many early maps do not have north oriented toward the top. In this case, north is to the lower right, roughly along the long axis of Utrecht. The story starts in the 1300’s when Eerst (= first) van Roijen or Roden is first found. 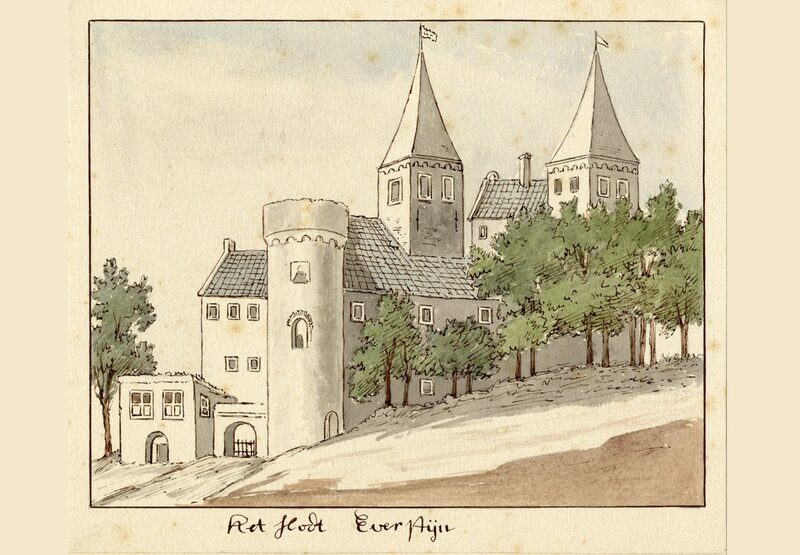 His son Eerst Eerstzoon (first first-son) van Roijen was born in 1375 and was a Schout, in that time, roughly equivalent to a mayor, judge and sheriff rolled into one. Hereafter follow a series of Eerst Eerstzoons, born in 1425 and about 1450. It was the 1425 Eerst Eerstzoon who was first “beleend” with “Hofstede” or Kasteel/Castle Everstein. Beleend is roughly equivalent to a grant from the ruling owner of the region such as the grants in England from the King to various Lords of the Middle Ages. A Hofstede is generally a large Landhouse or Manor which has been fortified and is often surrounded by a moat. 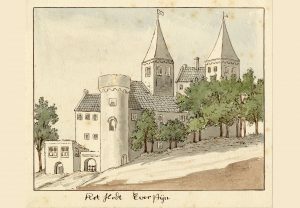 In this case, there is some discussion as to whether Everstein was originally a “Ridderhofstede” (Knight’s manor) or another sort of grant not tied to a knight. In any case, the family seems to have had possession of Everstein from the mid 1400’s through the early 1600’s when it was sold. At that point, it had been owned by the childless brother of the Van Rooijen of our line. Later, it appears that in the late 1600’s it was split in two parts, one of which was sold to the husband (a Drost) of a Van Rooijen and sister of Gooijert van Rooijen of our line. Gooijert also married a Drost and his children were entrusted to to the new Drost-Van Rooijen owners of Everstein after his and his wife’s death. So it was that our family may have briefly returned to the manor house in the late 1600’s. However, at that point it had fallen into some disrepair and was described as “ruined and at this point not yet rebuilt”. Today, there is nothing remaining of Everstein except a small island on the Nedereindseweg just west of the A2 highway where it is supposed to have stood. It is certainly likely that the early Van Rooijens farmed their land in the area of Jutphaas. 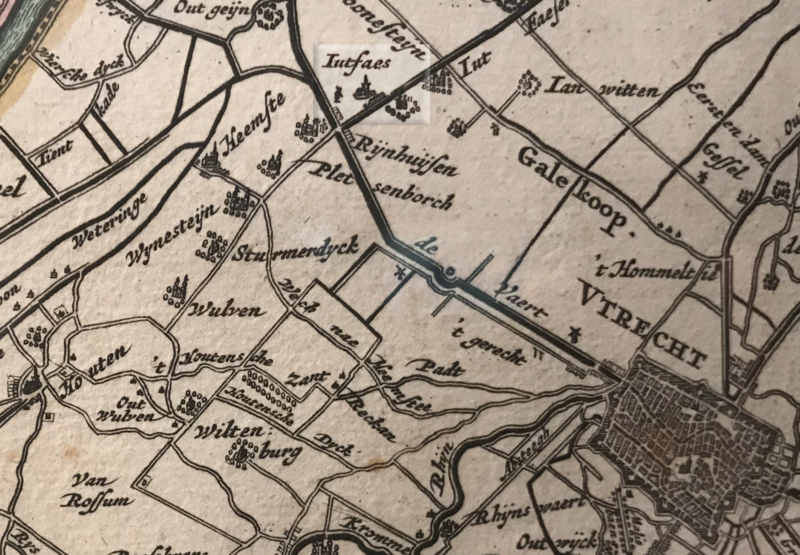 However, from 1446 through 1700, nearly every lineal Van Rooijen ancestor was either Schout or Schepen in the area south of Utrecht. The earliest was Eerst Eerstzoon , b. 1380, who was Schout of Oude Rhijn in at least 1446. His brother was Schout of Heicop, suggesting that the family history in this area may have extended back further to their father, the first Eerst van Rooijen of whom there is a record, or earlier. 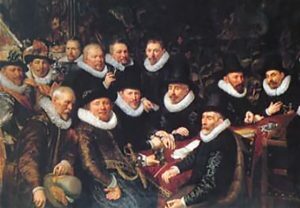 The painting from 1618 above (excerpt left) is by Jan van Ravesteyn and depicts the Mayors, schout en schepenen van ‘s Gravenhage receiving the “schutterij” or local militia. Although the Hague was a much larger city at the time, the image gives an idea of the clothing, facial hair and furnishings of the time. After the first Schout came another Eerst van Rooijen, then Jan/Johan as Bouwmeester or Master Farmer of the convent of Ijselstein in 1506. After this follow a series of Schepen, ending with Goijert van Rooijen (mentioned above) in the late 1600’s. In addition to lineal ancestors, many uncles and cousins also held similar positions through the end of the 1700’s. The Schepen were responsible with keeping order in the village and worked together with the Schout as judges but also as members of what we might now consider to be a city council. They were also responsible for ensuring that provincial orders were carried out locally. From the records it appears that the earliest Van Rooijens were Catholic, as would be expected for that time. However, the generations starting with Cornelius Claeszoon van Rooijen (b. abt 1535) through at least Jan Janzoon van Rooijen, b. between 1590 – 1600) were Dutch Reformed. Somewhere around the mid-1600’s, many of the Van Rooijens again became Catholics.